(18 August 2014, Seoul) Pope Francis’ visit to South Korea was a great consolation to our Sewol families. Greetings at the airport on 14 August upon his arrival, private meeting on 15 August before the Mass for the assumption day, holding hands during the car parade on 16 August before the beatification mass, baptizing Mr. Hojin Lee, a father of Seung-hyun on 17 August, and today’s Mass for Peace and Reconciliation at Myungdong Cathedral, Pope Francis met and prayed for Sewol families every day during his visit. The Pope always wore yellow ribbon, ‘Sewol badge’ during his time in South Korea. He also promised to take 6kg cross to Rome, which Mr. Hojin Lee, father of Seung-hyun and Mr. Hak-il Kim, father of Woongi carried during their 900km march for a transparent and independent investigation. 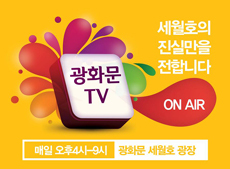 We believe that this shows that the Pope will not forget the Sewol ferry tragedy. The Pope responded to all requests from weak and vulnerable Sewol families. The Pope met me in person before the beatification mass and it was my 34th day of hunger strike. He also baptized Mr. Hojin Lee. Even though it might breach protocol of his visit, the Pope stepped down from the car to greet me and took the letter in person that I gave to him. As if the purpose of his visit is to comfort Sewol families, the Pope was with us during his visit. On the other hand, President Park Geun-hye’s attitude is far from Pope’s position. 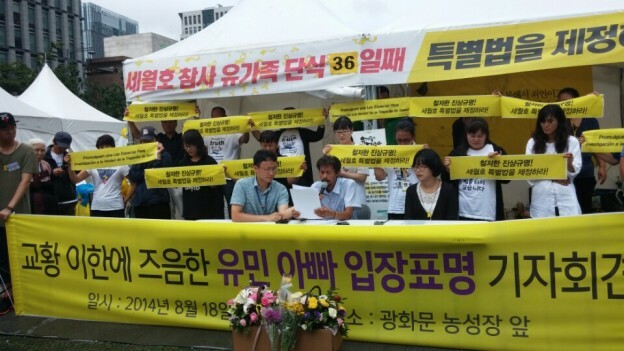 On 16 May when the President had a meeting with representatives of the Sewol families, she promised to meet us whenever necessary but it never happened again. From certain point, she did not even mention about the Sewol Ferry tragedy. The Pope met us more frequently than the President, even though he was here only for few days. I have continued my hunger strike for 36 days as of today, calling for enacting a special law for a transparent and independent investigation, but I have been totally ignored. I delivered my letter to the President Office and asked guards to check whether it was well delivered to the President, but even that request was ignored. The President promised to enact a special law for a thorough investigation and Sewol families’ request will be well reflected in that law. However, during the process, the President Office and the ruling party have been uncooperative, irresponsible and insincere while negotiating the special law. At the current stage, we cannot guarantee enactment of the special law due to a stubborn opposition of the ruling party. What kind of government ignoring its people who lost their children due to the government’s fault and went on hunger strike calling for a transparent and independent investigation? Why should Korean people appeal to the worldwide religious leader instead of our own government? President Park thanked the Pope for consoling the Sewol families. However, the President should be the one who comforts us. We can be healed only when we find out the reason of our children’ death. That is why we are continuing our hunger strike while risking our lives, calling for enacting a special law for a transparent and independent investigation. Without that, any other supports are unnecessary and not meaningful. The only way to comfort the Sewol families is to enact a proper special law on Sewol. Now I am very exhausted and in such a great pain. However, what I really fear is not my death but not finding the truth of my daughter and her friends’ death. So, I cannot give up. Please save the Sewol families by enacting a special law, as Sewol families want. Madame President, please make a firm decision. I request you to have an official meeting with us. I will continue to come to see you at the President House until our Sewol law is enacted. The Pope, who is not even directly relevant to the Sewol families, did not ignore our sufferings and pain. Madame President, who is responsible for Korean peoples’ lives and safety, I appeal to you not to turn your back against us who lost our children. English | tag: hunger strike, sewol, Yoomin, Young-oh Kim | 2014/08/18 by english.